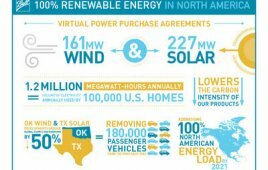 Tri Global Energy, the Dallas-based renewable energy company, has maintained its position as the leading developer of wind energy projects under construction in Texas, according to the U.S. Wind Industry Second Quarter 2017 Market Report from the American Wind Energy Association (AWEA), the nation’s trade association for the U.S. wind energy industry. Tri Global Energy has maintained the lead in Texas wind-energy development and the company currently has over one-half of all wind projects being developed in the state. Tri Global Energy also announced its expansion into Nebraska – the 100-MW Sugar Loaf Wind Energy Project. This is the first wind energy project for TGE beyond Texas borders. With the addition of the Sugar Loaf wind project, Tri Global Energy increases its wind portfolio to more than 2,900 MW of total wind power nationally. TGE’s Texas wind projects represent over one-half of all wind-power projects being developed in the state. Texas has nearly 5,337 MW of wind projects currently under construction. A total of 25,819 MW of wind projects, including those in Texas, are now under construction in the U.S., a 41% year-over-year increase. Wind power accounts for nearly all of the electricity generated from renewable resources in Texas, which easily leads all other states in wind power projects under construction. Globally, Texas is the sixth-biggest producer of wind electricity, following India and just ahead of the UK.